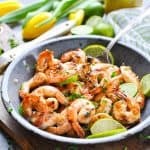 These Grilled Honey Lime Shrimp are a quick, easy, and healthy summer dinner! To make the marinade, whisk together all ingredients except shrimp. Marinate shrimp in half of the dressing for 30 minutes. Thread shrimp onto kabob skewers. Grill the shrimp over high heat for about 10 minutes, flipping halfway through. Small shrimp will cook faster (about 5-7 minutes), so adjust the cooking time based on the size of your shrimp. Use the remaining dressing to baste the shrimp while they cook. Don't have access to an outdoor grill? I've prepared these grilled shrimp on an indoor grill pan on the stovetop many times, and they work perfectly! Cooking Just for Two? Use just 1 lb. of shrimp, but keep the marinade measurements the same. Grilling instructions remain the same. Recipe adapted from Weber's All-Time Best Grilling Recipes magazine.